The number one cause of death in America is the American diet.1 Many people assume that our manner of death is preprogrammed into our genes. High blood pressure by fifty-five, heart attacks at sixty, maybe even cancer at seventy, and so on… But for most of the leading causes of death, the science shows that our genes often account for only 10-20% of the risk at most.2 For example, when people move from low-risk to high-risk countries, their disease rates almost always change to those of the new environment. New diet, new diseases. But the reverse is also true. If we’re eating the Standard American Diet and switch to a diet higher in whole plant foods, such as fruits and vegetables, this may lower your risk. Our Health Kit resources are licensed under the Attribution-NonCommercial-NoDerivatives 4.0 International (CC BY-NC-ND 4.0). Our materials can be copied and redistributed in any format as long as there is clear credit given to NutritionFacts.org, and as long as you are not using the material for commercial purposes. We do not allow alterations of these resources. Feel free to print and share this resource. Already subscribed to our e-mails? 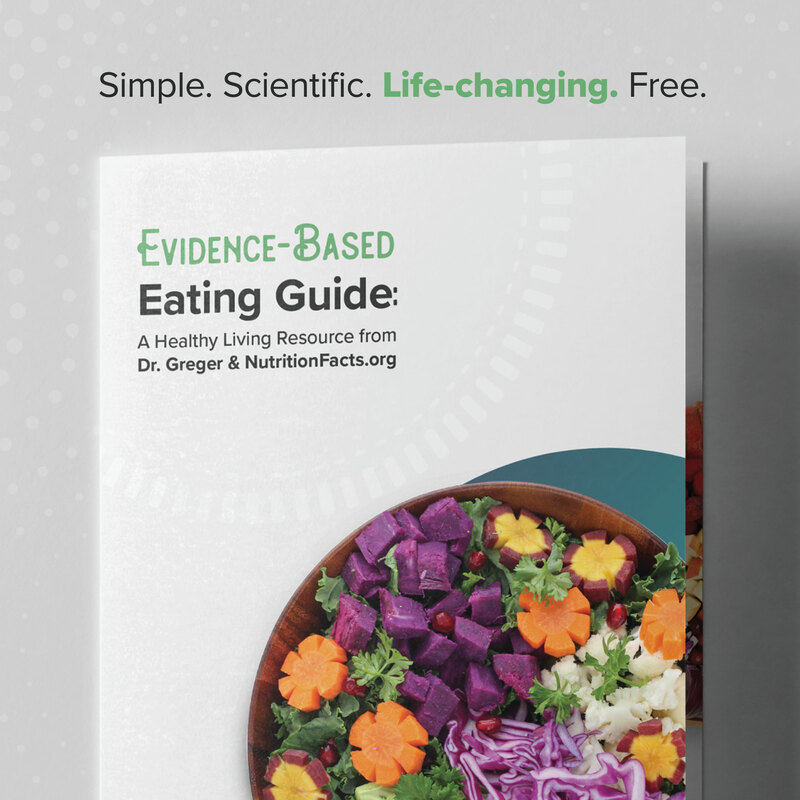 Click here to request a copy of our Evidence-Based Eating Guide. Mokdad AH, Ballestros K, Echko M, et al. The state of US health, 1990-2016: burden of diseases, injuries, and risk factors among US states. JAMA. 2018;319(14):1444-72. Willett WC. Balancing life-style and genomics research for disease prevention. Science. 2002;296(5568):695-8.